Since 1992, Santec Faucet has been designing and manufacturing products that stir the imagination and bring life to your bathroom dreams. Our collections embrace design themes ranging from traditional to transitional to contemporary. So no matter what your style, you’ll find it here. 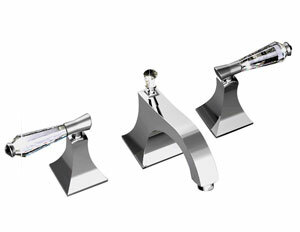 With our professional design experience, were uniquely qualified to be your best resource for bathroom fixtures. We have a talented design team dedicated to keeping current with international design trends, to bring you innovative, fashion-forward plumbing fixtures for every need and every taste. Our design process starts in-house and continues through our engineering, machining, plating and assembly processes. We are committed to eco-friendly business practices to insure that our products are safe for you, as well as the environment. We define our success through our products, but measure our achievement through our sustainability practices. We manufacture in Torrance, California and far exceed the rigid environmental standards mandated by the State of California.